*Retired; present address: 6816 Narrows Avenue, Brooklyn 20, New York. Color measurement of anatase and rutile pigmentations using various color-mixture functions has shown that Judd’s 1949 modification of the standard observer provides the closest agreement with visual perception. The effect of Judd’s modification is to change the z¯ function and the short-wavelength lobe of the x¯ function, so that for a tristimulus filter colorimeter it is necessary to change only the blue filter. Such a blue filter has been designed for use with the Colormaster differential colorimeter. With this new filter, accurate color grading (in agreement with visual perception) can be made for titanium dioxide. Spectrophotometric reflectance data. GE spectrophotometer, specular component excluded. Dry acrylic resin paints pigmented with rutile or anatase. Chromaticity coordinates for rutile and anatase pigmentations (dry acrylic resin paints) for various color-mixture functions (illuminant C). 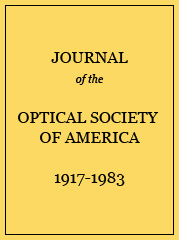 a The color-mixture functions used for the Stiles 2° and 10° systems were transformed as described by Judd (D. B. Judd and K. L. Kelly, invited paper SC 53, presented at the Spring Meeting of the Optical Society of America, Philadelphia, Pennsylvania, 1956). We used the same equations to transform Speranskaya’s data of Ref. 10. Correlation of visual ranking with ranking according to excitation purity.